The product of a project lasting over 60 years to study, research, and illustrate the natural wild flowers of the UK. W. Keble Martin started before the first world war and this book was not published until 1965. It records short descriptions of the plants with proper nomenclature and popular name. On the opposite page are the composite illustrations of the variations of flowers within a family. All the plants and flowers were drawn from life. 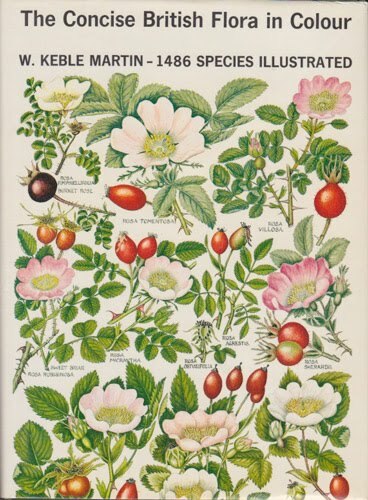 The book was a best seller when published in 1965 - a feat not yet repeated for a book about wild flowers. The primary reason for buying this book for me was nostalgia - for my childhood, expeditions to find wildflowers for a primary school project and (I now realise) for those wildflowers which are no longer common. There are probably quite a few people over the age of 50 who feel the same. Over and above that this was the book which introduced me to botanical illustration. I loved the fact that the wild flowers were illustrated rather than photographed and what seemed to me to be the very innovative way that the flowers were arranged on the page. I was hooked by this book and have remained interested in it and its subject matter ever since. RECOMMENDED: It's a brilliant book for those interested in wild flowers in the UK for people of all ages. ​W Keble Martin studied Botany at the University of Oxford, but he trained as a theologian and progress was to some extent dictated by his parish duties and where those parishes were located. The book developed from a recreational interest and drawings were only completed slowly. I used to be able to refer to this book at primary school when it was first published. I could happily sit for ages gazing at all the different plates of drawings of wild flowers. At the time, the focus was primarily on learning about and identifying wild flowers for a project. I now realise that this early exposure to botanical painting of specimens helped to generate a life long interest in botanical art. I rather suspect that there are other middle aged people like myself (and older) who also remember the impact this book had when it was first published in 1965. ​I've never owned a copy and am really pleased I've now got one (ordered from Roger Lucas Books). What struck me immediately when looking at it is how so many wild flowers are now now much less common compared to the situation nearly 50 years ago. The Concise British Flora was published in May 1965 when the author was 88. The book was the result of sixty years’ meticulous fieldwork and exquisite painting skills, and became an immediate best-seller. He completed over 1,400 paintings in colour and many black and white drawings before the book was finally published. One cannot help but be completely amazed at the scope and length of this project to document the complete wild flora of the British Isles It would be great to know where those volumes of botanical illustrations are now. Every figure on these plates was drawn direct from nature. The drawings were first made in the form of pen outlines of small separate sheets. On each sheet the name of the specimen was recorded, with the date, the place from which the specimen came and the name of the sender, if any or the referee who named it. These sheets form four octavo loose-leaf volumes. I've subsequently also bought "Sketches for the "Concise British Flora in Colour" for the princely sum of £1.62! It's all the sketches before they've been coloured and you can see how he developed them. Interesting for those of us who are sketching nerds!